We've arranged this kit so that you can install 8 feet of LED strip lights with a wall dimmer as easily as possible. Upon opening the the package, you'll find this kit has everything you'll need to complete your dimmable strip light project. 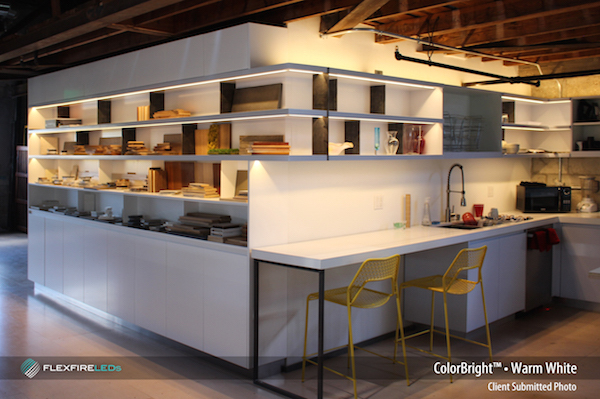 Our ColorBright™ series lights are popular with lighting designers and homeowners who are looking for reliable, bright, beautiful LED strip lights. ColorBright™ series single color strips are available as various shades of white (warm, natural and bright) as well as red, green and blue. With our solderless connectors, you can easily attach the flexible strips to nearly any surface imaginable. These lights are very low profile and highly versatile. Very easily, they can be customized to meet the needs of hundreds of applications. We suggest this kit for accent lighting or medium sized task lighting projects — such as under counter lighting. Product ColorBright™ Series LED strip light kit - 8 ft.